April | 2012 | Knit & Run! 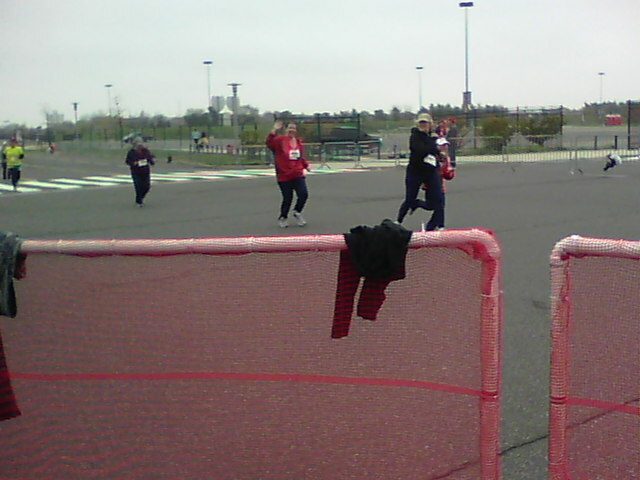 April 2012 – Knit & Run! It’s been a crazy busy week and I have no idea what to talk about. Well, other than I got a personal response from Phillies management–no, not Charlie–about my post on what happened on Opening Sunday. Nice to know they listen! Work is nuts, the house is nuts, life is nuts. But hey, I learned how to operate the lawn mower. Not bad for someone who hasn’t used one since she waas 14. The lawn looked pretty good, and I didn’t destroy the blades, either. PS: I lost 3.8 pounds in a week. Squee! I really can’t say it any better, so I’m leaving it at that. If I dare say so myself, this applies to me. To you too, if you’re reading this. Now go be the fabulous woman you are. I love Philadelphia. I’ve loved it since Ryan was little and being treated at Shriner’s Hospital, and one day I asked if I could go out to get him some McDonalds for lunch as a treat. The nurses said, “Sure! Go on out and take a break. He’ll be fine.” I’ll never forget pulling out of the parking lot with the windows down and smelling the clean, fresh air. Anyone who’s been on North Broad Street in the summer would die laughing, but that’s how it felt to me. People were nice, the air was clean, and I felt like I was home, even though I lived in New York at the time. Today I experienced Brotherly Love. 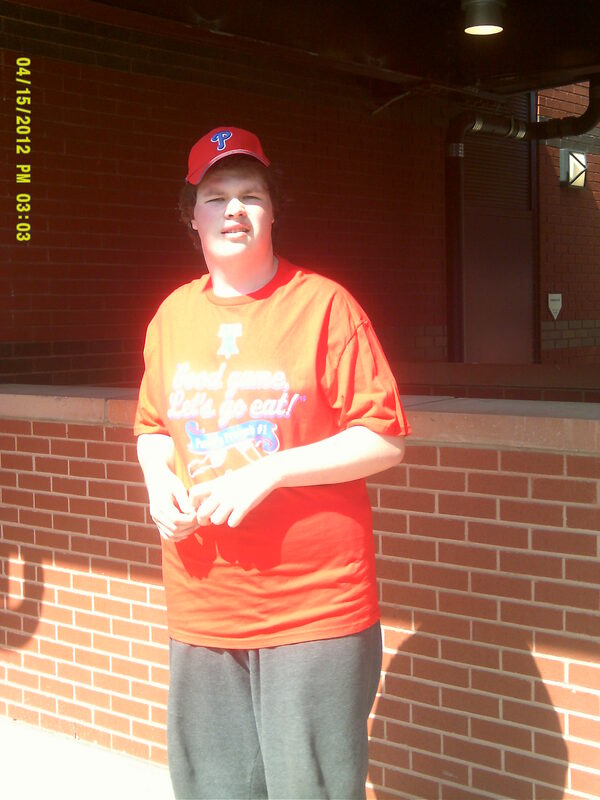 I had our usual Sunday season tickets for the Phillies game. It being the first Sunday home game of the year, I couldn’t wait. I missed the place over the long and lonely winter. 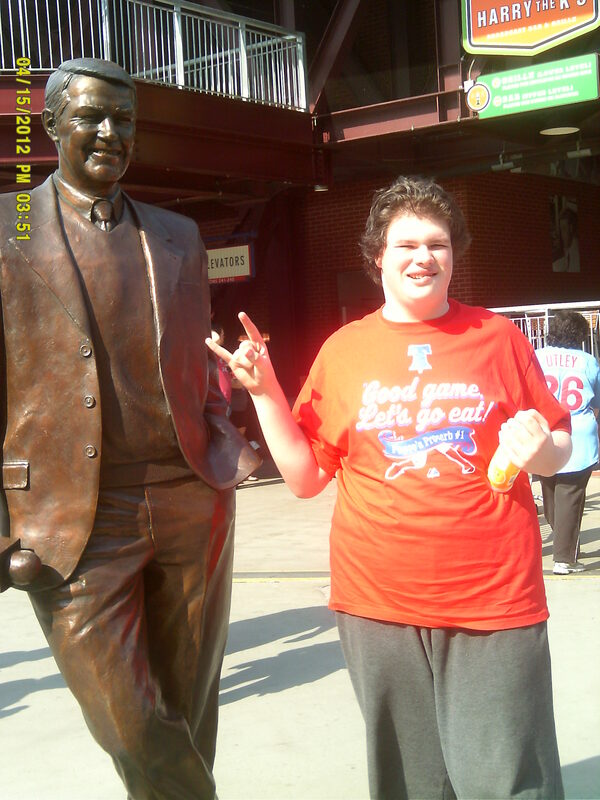 Citizens Bank Park is practically my second home. I know where everything is, to the point that I could probably navigate the place blindfolded. I love it there and I love baseball. If Heaven doesn’t in some way resemble Citizens Bank Park, I’m not going and that’s all there is to it. John went to the Saturday game with a friend, and a Mets fan’s kid dropped his ice cream down his back. Not on purpose, of course, but still an inconvenience when it’s the 1st inning. I didn’t give his bad fortune a second thought as Alex and I walked around the ballpark today, soaking in the atmosphere as fast as the crab fries. We got to our seats, the game started, I was knitting, Alex was recovering from eating $50 worth of food, and all was just great. Cole Hamels looked pretty good despite giving up a 2-run homer in the first; he put it behind him and got on with the game. Awesome stuff. Fourth inning, and behind me I hear, “BLURP.” I feel something hit my back. I look behind me. The woman 2 rows back has vomit down her shirt, across the bag on her lap, down her shorts and legs…and across the seat in back of me. And, consequentially, my back. Then I turn to Alex. It’s down his back too. I look at her. She looks like a mannequin, staring straight ahead of her like nothing’s happened, other than she’s been pithed through the spinal cord. I wait for a word, an explanation, an apology; something. Nothing. I think, “Well, okay, I’ve got a problem here.” I wave to get the usher’s attention, to get a rag or something. He’s distracted. I dig some napkins out of my bag and start wiping off Alex’s shirt. Pretty futile, but it’s better than doing nothing. A woman in the row behind me hands me a handful of baby wipes, bless her heart. It does more for Alex’s shirt, and I can clean off the seats too. I peel out of my jersey (thank God I opted for the tank-under-the-Utley-jersey look) and hang it inside out on the railing. Alex and I sit back to watch the game–it was the bottom of the inning; of course I’m not leaving–and then I tell Alex we’re going to go get him another shirt. I’d seen t-shirts with Hunter Pence’s famous, “Good game; let’s go eat” on it, and it’s perfect for Alex (considering he just ate $50 in concessions). I wanted it anyway; now I have a reason. We get the shirt. I ask for a shopping bag. I take Alex aside and have him change shirts right there. I put the dirty shirt inside out in the shopping bag, and we go back to our seats. Where three rows around our seats applaud us. I’m blown away. I guess they were glad I didn’t blow up or cry or do something pathetic. I just cleaned up and went back to the game. Pretty sweet. And in case you were wondering, the Phillies avoided the series sweep by beating the holy snot out of the Mets. Despite the puke shower, it was a good day all around. Not the soap opera (though I confess, I do used to watch it way back when). It just stuns me sometimes that people live in their own little world, not realizing how much more there is, even when it’s right alongside them. A woman I work with lost her husband this week. It was very sudden and we were all surprised. We knew something was up because she wasn’t at work during one of the busiest times of the year, and she’s very dedicated so it had to be something. Well, it was. By her own choice, she wanted to limit the spread of news, because my office has a grapevine that most news agencies would envy. She only told her manager, who told the rest of their department–with her okay–and because I know someone in her department, I found out and I told someone I work with. So today the info came down about the funeral arrangements, and she indicated she wanted the service to be private. My co-worker was actually upset. I mean, really upset. He thought it wasn’t fair. “Doesn’t she need our support? Doesn’t she want our sympathy?” Yes, he was serious. I just don’t get how people feel they have a right to make a show of their feelings, even if their feelings are only for show. What does this get them? “Brownie points into Heaven”, as my Mom used to put it? No. It does nothing. If she wants to be alone in her grief, she has every right to that. EVERY RIGHT. Everyone handles these things in their own way. She wants to keep things quiet. I’m sure she’s aching from the inside out right now. Her whole life has been turned around six ways ’til Sunday, and it’s going to take her a while to get her direction back. If she chooses a non-standard method of going through it, let her. It’s not about you. For what it’s worth, I’m serious. I want a big New Orleans-style sendoff, preferably at Citizens Bank Park, perhaps during a ballgame but if not, that’s fine too. They put on a great party. Look up World Series 2008 if you don’t believe me, or better still, check the video of Harry Kalas’ funeral. Each of the players carrying Harry’s casket to the car? Classiest move I’ve ever seen, but I can’t hear “Bridge Over Troubled Waters” without crying like a baby, yet I have 2 different versions of it on my iPod. How do you want to go out? It’s all up to you. I say, do it with your own personal style, and forget what anybody else thinks. Just like the way we should live life. Sorry I missed Thursday last week, but I was on vacation, visiting family in Florida, and there wasn’t time to get to it. 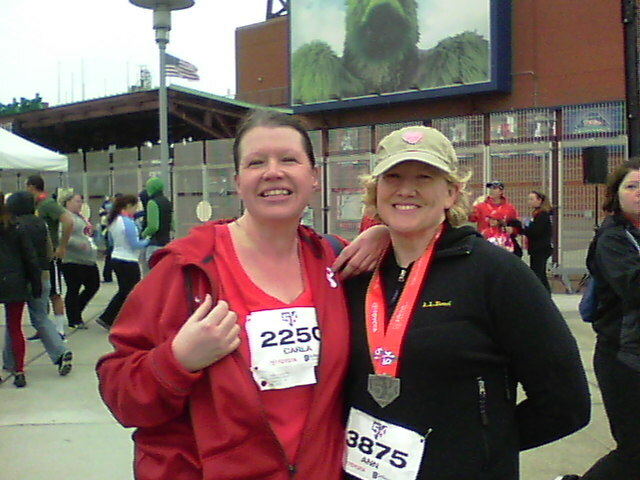 I did think about it, and really, I should’ve set something up from Saturday, after I finished the Phillies 5K. Do a search on Carla and you’ll see I came in 3819 out of 5,000. I’d be prouder of that stat if there weren’t over 1k DNFs and no-shows. 😉 But I did it, and I’m thrilled! There will definitely be more races in my future. The first mile was tough, but once I got into a rhythm, I could even talk while we ran. The course was great, everything went smoothly, and I had a great time. The best part was when we turned off Broad Street, onto Phillies Way, and Ann pointed out the yellow pedestrian sign ahead. She said, “When we get to that sign, we’re going to pour on the steam and cross the finish line at a sprint.” I said, “I don’t think I’ve got anything left!” but as we got closer, I saw the clock and realized I might just beat my best time for 3.1 miles. That got me moving, and I kicked it up and ran for the end. Of course, once I crossed the line, I all but dropped. 🙂 Partly out of gratitude and partly out of exhaustion, but all of me was thrilled to do it. So thrilled that when I saw free tote bags from one of the vendors, I went in that direction instead of taking my victory lap around the field. Dur!! Definitely next year. Next race: Mud Run! Thanks, Ann LaBar Russek, for keeping me going! !